Isn’t this lovely? Pretty much any time you combine a wealth of fresh veggies, herbs, olives etc, you get a beautiful and healthful dish. This is kind of a “Hey, let’s see what’s in the fridge” type of dip; you may have all or most of the ingredients on hand right now. I didn’t use exact amounts; I had most of a thing of cream cheese; “some” hummus; no garlic so I sprinkled in some garlic powder…like most dishes it lends itself well to improvising. In medium bowl blend cream cheese, lemon juice, Italian seasoning, and garlic – use a wooden spoon or an electric mixer to combine until smooth. Spread cream cheese mixture into a deep 9-inch glass pie plate, or shallow serving dish. Evenly spread hummus on cream cheese layer. 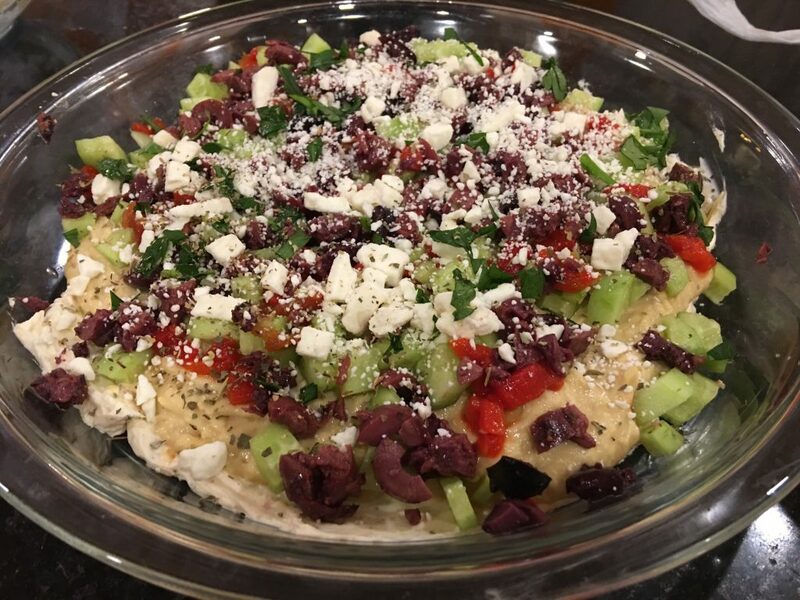 Top with cucumber, tomato, olives, feta cheese, and green onions. Cover and refrigerate 2 to 24 hours. Serve with pita chips or bread. Makes about 2-1/2 cups dip (16 servings).